Whenever we go to Pasta Palazzo we always order grilled calamari and their polenta. Since we haven’t been there in a long time I set forth to emulate this spectacular dish.And let me tell you, I think I exceeded my expectations. I also made up a helping of the grilled calamari, but this time I did everything without scewering – it turned out pretty much the same. I used fresh mozzarella, but next time I’m going to use either Queso Fresco from the Latino section of A&G or Fontinella Cheese as stated on Palazzo’s menu – as long as I can find it . Cook and stir about 3-5 minutes until good and thick. Immediately pour into a 9×13 pan – no grease necessary. Refrigerate until set about 30 minutes. Grill on greased grill over med heat. 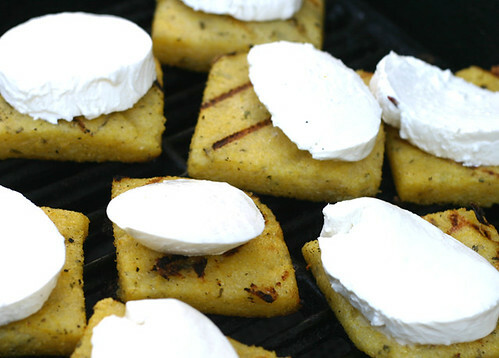 If the grill is too hot or not greased the polenta WILL STICK. 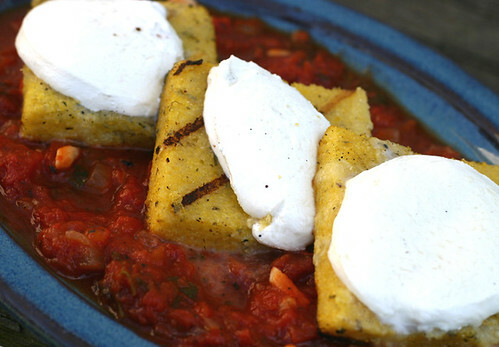 The polenta is already cooked so really you’re just heating it up on the grill and getting grill marks and grill flavor. Regular canned whole tomatoes will work fine. Let Simmer 10-15 min and serve hot. WOO HOO!! San Marzano tomatoes!!! 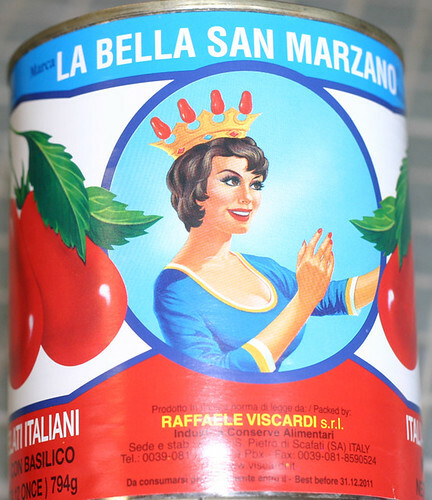 I’ve been hearing about these Italian tomatoes everywhere this past year. I’m growing them in my garden just to see if they’re as good as advertised. They’re said to be THE BEST tomatoes for sauce ever!!! Jack Farrell talked about them a couple months ago on his food/wine show for Haskell’s. Jodi Picoult mentions them in her novel “Mercy”. I’m so anxious to try them! I have fifteen little plants waiting to get in the ground! And, just think, Mary found them in a can! Made a batch of the polenta this weekend. Really simple and tasted great! Served with some motz and leftover spaghetti. This dish looks incredible! I’ve only recently started eating poletna, and I love it, but I’ve never had it grilled. Can’t wait to give that a try!